I wished to make it a bit more loyal to the book in terms of characters, story and mood. And also visually closer to the rest of the films in the saga. Always keeping in mind that however dark the story may be, it still takes place in a magical and beautiful world, at least in the book. * Chroma and luma adjustments throughout most of the film. - Cut shot of Harry's eye during the Intro. - Cut Dumbledore talking to Harry about the waitress and how he's not returning to Little Whinging. - Cut Harry apparating outside The Burrow by himself and then looking at Ginny. - Cut Dumbledore talking about Harry's love life. - Cut Cormac and Hermione looking at each other during Quiddich. - Cut shot of the potions book where sectumsempra is misspelled as "sectumpsempra". - Cut Cormac licking his fingers at Slugurn's dinner party. - Cut shot of Ron's breakfast before Quiddich. - Cut Lavender's line "I think this room's taken". - Cut Hermione crying and Harry's line "It feels like this". - Cut Ron and Lavender kissing on the staircase. - Cut duplicate shot of Draco uncovering the Vanishing Cabinet. - Cut Ginny feeding Harry. - Cut the line "The first night of the cycle's always the worst". - Cut Ginny tying Harry's shoes. - Trimmed Ginny standing helplessly while Greyback approaches her. - Cut The Burrow being burned down. - Cut Harry knocking on Slughorn's door. - Added deleted scene of Harry and Hermione discussing the Marauder's Map. - Cut Hermione and Lavender's fight at Hogwarts infirmary. + Added deleted scene of Harry telling Hermione and Ron that Malfoy has been going to the Room of Requirement. - But cut all talk of the vanishing cabinet whithin that scene. - Cut Snape and Dumbledore's discussion at the Astronomy Tower. 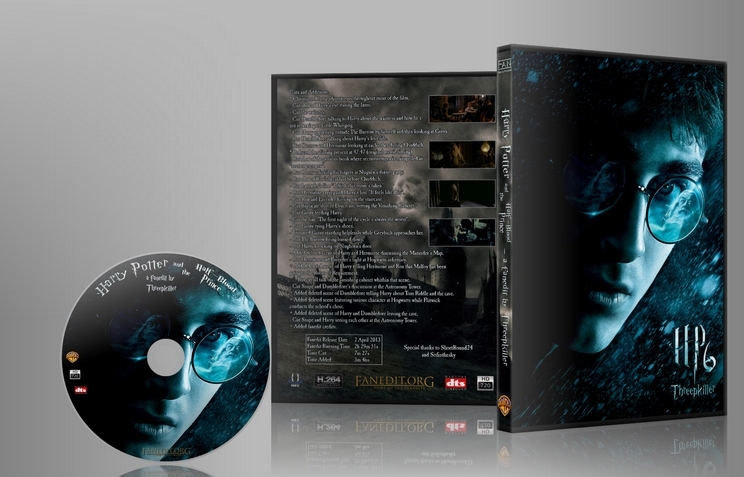 + Added deleted scene of Dumbledore telling Harry about Tom Riddle and the cave. + Added deleted scene featuring various character at Hogwarts while Flitwick conducts the school's choir. + Added deleted scene of Harry and Dumbledore leaving the cave. - Cut Snape and Harry seeing each other at the Astronomy Tower. I was initially worried that attempts to cut the teen drama would fail. I was wrong. The edit flows naturally and seamlessly improves this film by quickening the pace and removing awkward lines and stares. The addition of deleted scenes was marvelous; the choir cuts were excellent. The only thing that stuck out was an overly-loud word spoken by young Tom Riddle in the first flashback. Additionally, Threepkiller's removal of the awful green tint makes a few scenes almost black and white; however, this is not a problem unless the viewer is overly attached to the official cut. Otherwise, this edit is superior to the theatrical. I would recommend this version over the original: it's not too different and yet enhances the source material immeasurably. This edit does not seem drastically different from the original film but this is mostly on account of the fact that Shortround24 has executed each change with care and precision. The cuts and modifications are seamless with very little noticeable audio or video transitions where there shouldn't be. The removal of the Burrow on fire is well done and while the scene remains anticlimactic the whole sequences now plays much better in the context of the film. Where this edit really shines is the inclusion of several essential deleted scenes, again seamlessly integrated. Another nice touch is a complete re-grading of the films color scheme to remove green tint. In some cases the color skews too far to the red (such as in the opening action scene with the collapsing bridge) but the majority of the time it enhances the film's Oscar-nominated cinematography. This edit has now become my go-to version of the film to watch, over my DVD Copy. This edit was a fantastic alternate dark take on the half blood prince! As a huge Potter fan, I enjoyed this streamlined and darker version of the story. The color correction is beautiful and the deleted/alternate scenes were a nice addition. For me this was not a replacement of the original, but a nice alternative if you're not in the mood for mockery of high school drama. An absolutely amazing job! The color correction and integrated scenes are seamless. I have to commend your fanedit on a technical stand point in terms of video and audio quality. The cuts have been smoothed out and the integration of the deleted scenes is unnoticeable, tremendous effort on the cutting of the “choir” scene. The colour correction for the most part looks good, with some scenes looking absolutely fantastic. The “start-of-term feast” and “Quidditch tryouts” scenes come to mind improving on the variety of colours but maintaining a dark overall mood. The removal of the green-haze which plagued the original is gone for the most part, however this has affected the colour of the slytherin robes in some scenes (potions class, start-of-term feast) appearing blue rather than the standard dark green. Although this in my opinion can be completely overlooked as the footage looks stunning. Unfortunately, (and this is due to a lack of available footage) the film suffers from being quite slow and tedious at times. This is not a fault with your edit it is a problem I have even with the originals portrayal of “story”. I even find it hard to sit through my own edit, in which I was much harsher in cutting and re-ordering scenes and dialogue. However I have to say that your edit does add more weight to Dumbledore’s demise (cutting allusions to Snape) and strengthening the overall narrative. Any Potter Fan looking for a complete and more enjoyable experience over the original will find pleasure here. This film will always been the black sheep for me; short, anti-climatic action scenes, dodgy attempts at humour, unrealistic and out-of-character love scenes (which you nicely did away with.) My experience with “The Half-Blood Prince” is boredom in simple terms, my passion for the books and earlier entries into the film franchise were the only things that held my interest when I first saw the theatrical cut. 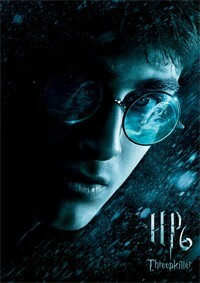 It weakened my interest for “Potter” for a long time and shied me away from the series in general. But your technically sound cut of the movie and the experience of helping you along the way has re-kindled my enthusiasm for “Harry Potter” and I thank you deeply. Oh and thanks for the credit mention!